Of all the types of stellar groups in the sky perhaps the most interesting are the stellar collections that we know as star clusters. Any typical star cluster may have anywhere between twenty and several million stars, which astronomers have sub-divided into two distinct classes — the open star clustersand globular star clusters. [A1] In this section, however, we will restrict our discussion on the Open Star Clusters and their subgroup systems known as the Associations. 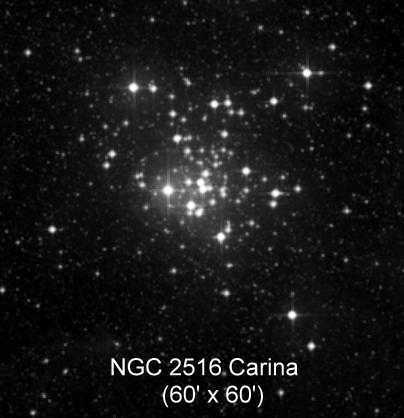 As their general name suggests, most open clusters appear as loose congregations of stars related only by their components mutually shared gravitation. Of all these groups, telescopically, several of the brightest are perhaps the most spectacular vistas of all the celestial objects available to amateur and professional observers. Many are gloriously exquisite being easily visible even to small or moderate sized telescopes. Others clusters may contain anywhere between several multicoloured bright stars of varying magnitudes, while some may only contain may old reddish stars — appearing to consist of just uninteresting collections of many faint stars. Serious amateurs are mainly restricted to observing only the faint variable stars and perhaps several close double stars. Some amateurs testing the powers of their apertures may resolve the faint or more difficult clusters, which have real advantages observing among our urban or city skies. It is only the professional astronomers that can really achieve useful information by serious investigation, and with much pondering and research, eventually discovering their true natures and long evolutionary histories. We do know that all open clusters are born among the nebulae — those vast gas clouds of dust and gas — producing stellar nurseries within our Milky Way. Consequently all stars do not form independently, but are generally created in vast numbers to form into star clusters. A number of these stars are collected together, and will form either single, binary stars or multiple systems. Such stellar hierarchical systems are important to know about, as they can determine and influence the long-term fate of the cluster. Open clusters are often considered quite stable gravitational systems but in truth are prone to suffer losses of stellar members. They are thought to eventually disintegration due to the internal forces influencing the dynamics of the cluster, the gravitational forces of the galaxy or by nearby stars. Astronomers are very interested into what happens once such clusters fall apart — being termed OCR’s or Open Cluster Remnants. These are investigated to find clues about early star clusters and towards the early evolution of the Milky Way. Such consequences are among the current cutting-edge study and investigation by astronomers, who compare real telescopic observations with computer simulations. This is now the primary focus of many star cluster investigations. This will be coming soon. Promise!